The site is generally dry and problem free and our friendly farmer next door is readily on hand to help if there is a problem. The Beach, riding stables and views across the straits to Caernarvon Castle are all within 1 mile walk from the site. Our favourite beach at Newborough is huge and joined to the enchanted Llanddwyn island and in site of the spectacular Snowdonia mountains and the Rivals (Yr Eifl) on the Lleyn peninsular. Snowdonia Surfing, “the longest Zip Wire in Wales”, Mountain Climbing / river activities around Llanberis, Ancient castles at Beaumaris, Conway, and Caernarvon and many historic sites all within easy driving distance. 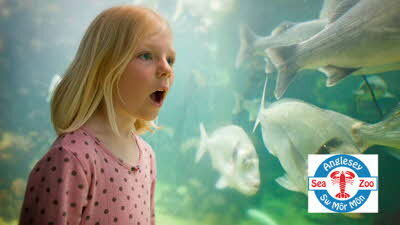 As well as Plas Newydd country house and gardens, Plas Cadnant Hidden Gardens, Anglesey Sea Zoo and Halen Mon salt, Pili Palas butterfly attraction. Dylan’s and Freckled Angel etc. 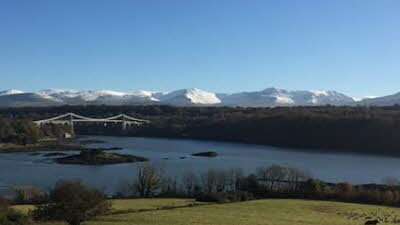 in Menai bridge, Marram Grass in Newborough, Oyster Catcher in Rhosneiger, The White eagle at Rhoscolyn, and the Midland and Bulls Head in Beaumaris. Joan looks forward to welcoming you to her CL. This was our second CL site on Anglesey and compared to out first site this was disappointing to say the least. The directions are somewhat confusing with no signage at the site entrance. The grass was in need of a cut, the site gate was broken, the information room consists of a few leaflets stacked in a grubby toilet. Amperage was so low we could only run one appliance at a time. There was no greeting, the only time we saw the owners was after 3 days when we found them to pay. We also were charged £15, being £2 extra because it was September and it was claimed that more electric is used in September which was a joke considering the amperage and the fact that it was so mild so no heating was used! We had to leave a day early as our granddaughter had been rushed into hospital and no refund was offered for the night we didn't stay. 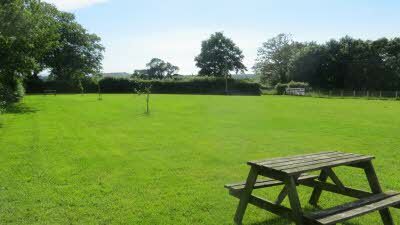 On the good side the site is very spacious, peaceful and quiet and no doubt with a little TLC and better treatment of visitors this could be a cracking little CL. In my opinion this is an average CL. We never saw the owners except to pay as they were nowhere to be found when we arrived. As I write, there are 9 caravans here and has never been less than 7. The area is big enough to take them but that’s not the point. The loo on site is basic but its there and useful. Grass is regularly mown. And despite the brown grass at home in this hot summer of 2018, here it is green and lush! Others have covered many points about things to do nearby (I would add that access to Newborough Forest in now £5 but good value). I don’t think the NT property Plas Newydd has been mentioned. We had a great day there and the story of the house is fascinating and well presented. The mural by Whistler is stunning. My only other point is that although the directions are spot on, passing through the village of Brynsiencyn is difficult solo and very difficult towing owing to parked cars outside the terraced housing. We are looking to find an alternative route when we leave. Personally I wouldn’t use the site again. A great CL, very well laid out and easy to find. Directions on the site were spot on and a CL sign outside the gate to the house. Driveway is a little uneven but nothing to worry about - the CL itself is a great grass location and appeared to be well irrigated to prevent flooding. Water/waste point is easily accessible and a small outdoor loo and sink is on hand if needed. We booked with Joan but didn’t meet her, instead we met her husband/partner, Richard who was lovely - very welcoming. Could t fault the place - ideal for getting to Newborough and easily back onto the mainland. Access is easy down a few narrow lanes. There is no CL sign on the turning after the working farm: the turning has a yellow fire hydrant sign on the corner. N CL sign on the Bron Menai drive entrance either but the name is clearly displayed. Entrance is wide as is access to the field. Field is on a gentle slope and had been cut soon before we arrived. A very well maintained CL with water, waste, bins etc on the CL itself. There’s 10 hook up points around the CL so even if there are 4 outfits on site when you arrive you’ll still have a choice of pitch. Access drive is stone. Turning into the CL and the CL itself 100% grass which can get soft after rain. We’d previously attempted to book April 2016 after rain but Joan said that we could only stay if we had 4x4. We stayed May 2017. It rained for about 12 hours when we were on site but ground remained firm. Anglesey can be a windy place. This site is quite sheltered surrounded by high hedges. 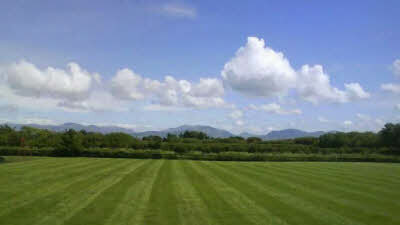 There are partial views of Snowdonia from some pitches. Joan is very welcoming and let us stay well after midday on the day of departure because she had no one booked to come on. Joan runs a B&B which is often used by family and friends visiting members staying on the CL. The Anglesey Coastal Path runs adjacent to the other side of the B&B, access from the road a short walk from the CL. 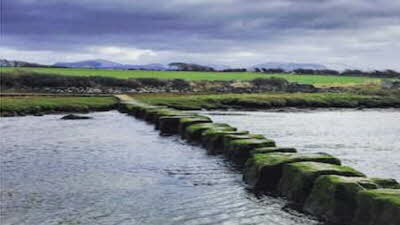 Take the Path north/west you will reach the Giant’s Stepping Stones after a mile and a half. The route is mainly gated but there are two stiles. Take the Path south/east and it will wind its way down minor lanes and tracks reaching the Menai Straight after 2 miles. The fabulous Newborough forest (which has about 50 miles of footpaths criss crossing it) and beach (5 miles of sand) is 5 miles from the CL. It is operated by the Council. There’s a £4 charge per vehicle. Loads of parking in the forest and by the beach. The forest and beach are extremely popular. The narrow access road is through Newborough village. I’ve only visited spring and autumn when it is busy enough. The Council kiosk is only staffed till 6 pm when I’ve visited after which access is free of charge. There are a couple of free carparks in the forest immediately off the A4080 a few miles north of Newborough. These give access to quieter parts of the forest though the beach and a 2.5 mile walk to the beach. The forest is great for everyone: there are waymarked walking and biking trails. There are also waymarked running and horse trekking trails – something I’d never previously seen sign posted in a forest before. There are many more unmarked trails. Very popular with dog walkers. Dogs aren’t permitted onto the popular section of beach between the carpark and Llanddwyn island 1 May to 30 September, but that still leaves miles of beach open to dog walkers. Anglesey Riding School is a mile away from the CL. 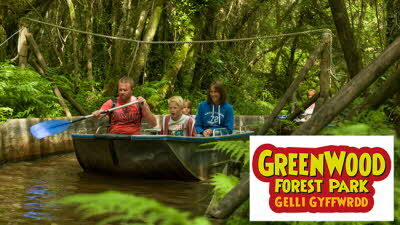 This is popular with locals and tourists with views of the Menai, Snowdonia and the Llyn mountains. We had a fabulous 5 nights on this site. Joan and her husband were very welcoming. A lovely CL. 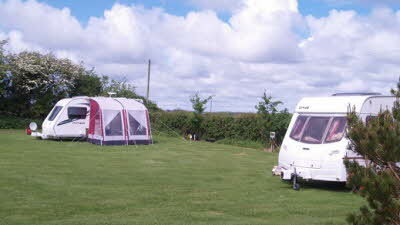 Nice spacious field with easy access, not far from main road, and always a plus to have a toilet on a CL site. Our daughter particularly enjoyed making friends with the ponies in the adjacent field. 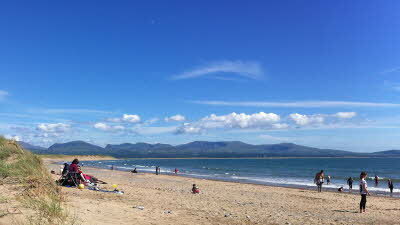 The stunning Newborough beach is only 10 mins away and Plas Newydd is just up the road. 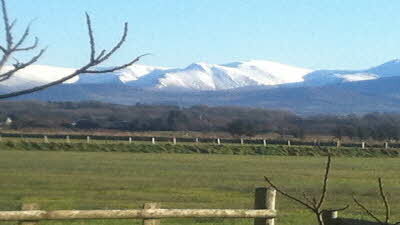 However, being Anglesey, nothing is too far away anyway. Can definitely recommend this site.